At the meeting yesterday Gill G. gave some handy DIY home remedies for critters. Her suggestions have been added to and perhaps some of these 'recipies' might be the go for you - especially if you're not keen on chemical sprays. If you have a tried and tested home remedy please share it with us in the comments below - there is no need for you to register just make an anonymous comment if you prefer. We at Coffs Garden Club are interested in your experiences. Grasshoppers - Use a wide container to attract a lot of grasshoppers, in this container (a yellow one is good as they are attracted to that colour) fill 1/3 full with water, add canola oil to prevent mozzies, add maple syrup to attract the grasshoppers. The theory is the grasshoppers are attracted to the maple syrup and drown. Tomato Leaf Spray - is effective in killing aphids and mites. It works because the alkaloids in the tomato leaves (and the leaves of all nightshades) are fatal to many insects. Simply chop one or two cups of tomato leaves and soak them in two cups of water. Let it steep overnight. Strain out the leaves using cheesecloth or chux or a fine strainer; then add another one to two cups of water to the liquid and add it to a spray bottle. Use the mixture by spraying the stems and foliage of the infested plant, paying particular attention to the undersides of leaves since that is where aphids most commonly congregate. One word of warning though, whilst this spray is very safe for humans, there are some folk who are allergic to members of the nightshade family - if this is you, give this one a miss. Hot Pepper Spray - is a terrific solution if you have problems with mites. Simply mix two tablespoons of Tabasco sauce, a few drops of biodegradable dish soap and 4 cups of water and let it sit overnight. Use a spray bottle to apply the spray to infested plants. Hot pepper spray works because of the compound capsaicin (which causes the 'heat' in hot peppers) is just as irritating to insects as it is to us. This mixture also helps repel whiteflies, but it may have to be reapplied if you start to see the mites or whiteflies returning. Garlic Oil Spray - is a great, safe insect repellent. Simply put three to four cloves of minced garlic into two teaspoons of mineral oil. Let this mixture sit overnight, and then strain the garlic out of the oil. Add the oil to 2 cups of water, add a teaspoon of biodegradable dish soap. Store in a bottle or jar and dilute the mixture when you use it by adding two tablespoons of your garlic oil mixture to 2 cups of water. The garlic spray works because the compounds in garlic (diallyl disulfide and diallyl trisulfide) are irritating or deadly to many insects. The oil and soap help the mixture stick to plant leaves. What insects does garlic oil repel you ask? 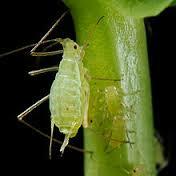 Whiteflies, aphids and most beetles will avoid plants sprayed with garlic oil. A word of caution - don't apply this spray on a sunny day because the oils can cause foliage burn. Or another method for Garlic Spray is to place 2 whole bulbs of garlic into 10 cups of water, bring to boil and leave overnight to steep. Strain out the solids and mix 1 part to 3 parts of water. Simple soap spray - is very useful in taking out a wide variety of garden pests, including aphids, scale, mites and thrips. Just add one tablespoon of dishwashing soap to 16 cups of water and spray the mixture on the pests. Why does this work? 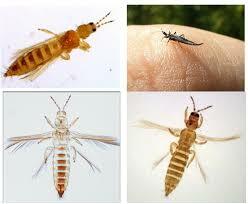 The soap dissolves the protective outer coating on the insects. One from Marg C. - Beer for the snails and slugs - sink a tuna can or pie plate into the ground, add some beer to about 2.5cm from the rim of the container. The slugs will go in for a drink and drown. Beer works because the slugs are attracted to the yeast. It's really important to sink the container into the soil and keep the beer about 2.5cm lower than the soil. This way, the slugs have to go down after the beer and they drown. If the beer is near to the rim and at soil level, the slugs and snails can just have a jolly good time before heading off to munch on your plants!